It is not easy to review a book written by a comrade; John Cowshill was a member of RS21 (as I am) from our foundation and has been a member of the North London branch whose meetings I have previously posted. 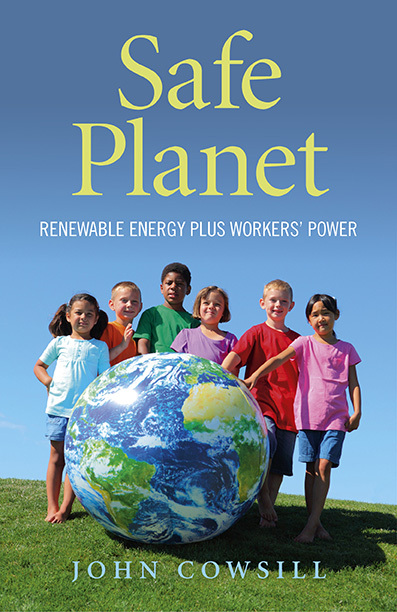 Earlier this year, he published Safe Planet, an attempt to bring together two potentially disparate elements of Marxist theory – first, an explanation of the mechanics of how it might be possible to power the world by the use of renewable electricity, and second, an argument that the people most likely to make this transition happen were the world’s workers. “Communism is soviet power plus the electrification of the whole country”, Lenin wrote in 1920, Safe Planet updates this message. The first half of John’s book explains that the world already has a problem with generating sufficient energy, and that this problem will get worse in successive generations as (for example) hundreds of millions of people in East Asia enjoy the more affluent lifestyles which are likely to follow the massive expansion of industry in China. Our economy is still based on the assumption that this electricity can and will be generated principally by the extraction of fossil fuels, hence the adoption of technologies such as fracking which are intended to extend the lifetime of coal, oil and gas. A problem with the continued use of fossil fuels is that they are enormous polluters, principally by producing excess carbon dioxide which is causing the world’s temperature to rise. Our collective dependence on carboniferous capitalism is already causing droughts, famine and extreme weather conditions and every indication is that its destructive consequences will only get worse. So, the world needs to move to alternative forms of energy production, including greater use of renewable energy. But a principal problem with the greater use of wind, solar and tidal power is that the energy they produce surges, and is not generated continuously (there is no solar energy production in the middle of the night; while it is easy to site wind farms far out to sea such farms are relatively less productive than land-based turbines…) and any electricity can only be stored with difficulty. John argues for the adoption of a system of energy storage based on a model proposed nearly twenty years ago by Willett Kempton and Steven Letendre – in effect, that we should replace the engines of every oil-burning motor car with electrical motors which can double-up at night-time as a series of millions of batteries holding all the unused electricity. I find this model intriguing even though it does raise further questions. What would the carbon costs be of tens of millions of adapted car batteries in Britain or billions of them worldwide? And who be the advocates of the movement that would be required to make this change happen? The most impressive parts of Safe Planet involve the critique of other writers who you might term “pale green” (my phrase, not John’s), in that they call for greater use of renewable electricity but portray themselves as moderate and make unnecessary concessions to the fossil fuel lobby by stating that renewable energy cannot be the majority source of electrical generation for many years to come. In particular John criticises David Mackay and George Monbiot who, John argues, have been unnecessarily pessimistic about how quickly the transition to renewables could be made. Mackay has argued that no more than 15% of UK energy production could ever come from renewables; and John argues that this assessment is based on a series of wrong assumptions – about the generating capacity of wind power in particular. I have no independent knowledge of climate science, neither of the mathematics of transport use (a key factor in John’s equations) nor of the efficiency of wind farms, but I found John’s arguments persuasive. Since his book was published, life itself seems to have born out their accuracy: for example, in one day in October 2014, 24% of UK electrical generation was from wind power. While this was an exceptional day, bringing together outages in the nuclear sector, unusual meterological conditions, etc, this happened, and was far beyond the outer reaches of Mackay’s model. Even if it is treated as a relative anomaly, the direction in which we are all (too slowly) heading is clearly towards the greater use of renewables and (seemingly) the eventual disproof of the pessimists. The second half of John’s book is an argument that the transition to a system of renewable electricity will only happen, at the necessary speed, if it is accompanied by a successful social revolution in which the world’s workers take over the means of production. I agree, but it is easier to persuade readers that the major oil producers are an obstacle to a necessary change than it is to persuade them that the world’s workers in particular have an overwhelming reason to make this revolutionary transformation. In the first half of the book, John’s focus is on a single group of capitalists, those involved in the production of fossil fuels, whereas in the second half of his books he pits all capitalists against all workers. More work needs to be done to show that reformist solutions to ecological catastrophe are utopian. At least at the level of hypothetical possibility, it is conceivable that capital in general could recognise that its collective survival rests on the defeat of a particular capitalist layer and therefore that fossil fuel capitalism should be subordinated. In the last 150 years, many things which were previously thought to be essential to capitalism have been wilfully diminished – the airborne polluting technologies that horrified the civil society of nineteenth century Manchester, the big tobacco companies which were so important to postwar America, the CFC technologies that caused the hole in the ozone layer. None of these technologies were entirely defeated, none of these pollutants have altogether gone away. And yet none of them are as dominant within the world’s economy as they once were. If, as John seems to believe, that there is a different relationship at stake, a deeper relationship between oil production and capital itself so that only a revolutionary alternative could enable the shift to renewables then this needs to be directly argued. The final sections of Safe Planet set out with clarity and in an accessible way, a series of ideas which will be familiar to longstanding readers of this blog, ie the tendency of capitalism to go into periodic cycles, the role of workers as revolutionary agents, the limits of the trade union bureaucracy, the necessity of an independent rank and file and of a revolutionary party. These are good arguments rooted in a vision of collective emancipation and John is to be congratulated for putting them in a different format so that they will be read by people by a new audience probably motivated more by ecological concerns than with the nuance of the socialist tradition. But my honest reaction to reading – in a new place – arguments that I myself have made often enough in other places was to feel a strong need for their updating. The analysis of socialist transformation rests far too much on analyses generated in the heroic period of the postwar working class. In contrast to the world in which I was born, unions are weak, and we are all told repeatedly that education rather than collective struggle will maximise an individual’s life chances. The price of labour has become implicated with the price of the social wage, which capital has waged a 50-year struggle to reduce, manipulating scares around immigrants. Bureaucracy is no longer a problem experienced only by unions but by a large number of other social movements. In an epoch where technologies tend to separate people rather than binding us together, struggle still takes places but class consciousness is falling not rising. There is no longer a clear majority of people employed in full-time permanent jobs, in which any individual worker can maximise their economic worth by being part of social movements to increase the price of their labour, so that a revolution can be portrayed as simply the inevitable final product of a series of militant workplace struggles. The link between protest and class consciousness needs to be remade. It is unfair to expect a short book on the very specific topic of global warming to contain the answers to everything. But I am not singling out John’s book; all of us who come from an IS tradition need to be aware that the metaphors we employ risks becoming drained with repetition. And if they seem tired to us, it is likely that others will feel their exhaustion with even greater conviction.